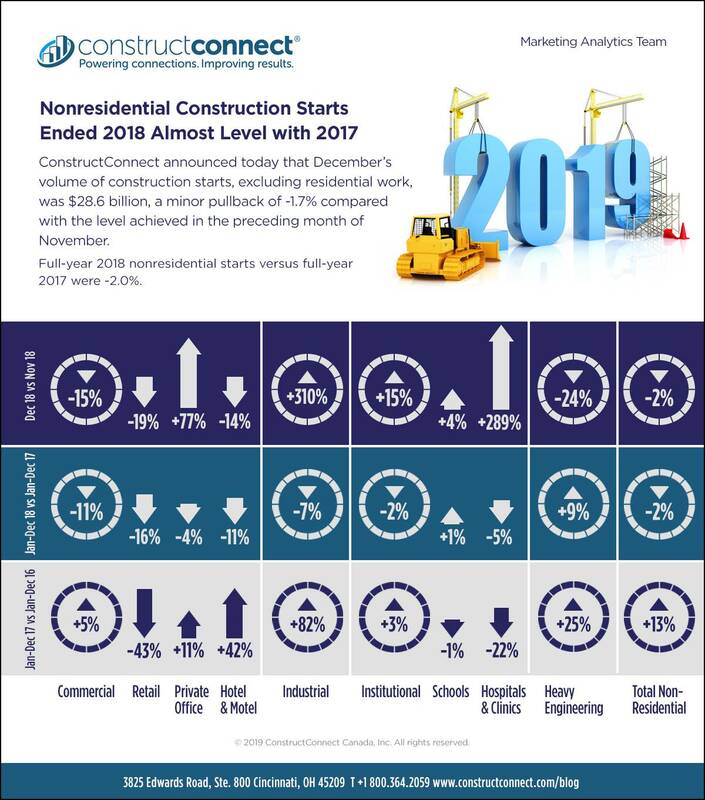 ConstructConnect announced today that December’s volume of construction starts, excluding residential work, was $28.6 billion, a minor pullback of -1.7% compared with the level achieved in the preceding month of November. The long-term history of change in starts volumes between November and December, due to seasonality (i.e., worsening weather conditions), has been -5.0%. Nonresidential starts in December 2018 relative to December 2017 were +16.9%. December 2018 versus the previous five-year average for December, − i.e., from 2013 through 2017, − was +1.6%. Full-year 2018 nonresidential starts versus full-year 2017 were -2.0%. ‘Nonresidential building’ plus ‘engineering/civil’ work accounts for a larger share of total construction than residential activity. The former’s combined proportion of total put-in-place construction in the Census Bureau’s latest report, for October, was 59%; the latter’s was 41%. ConstructConnect’s construction starts are leading indicators for the Census Bureau’s capital investment or put-in-place series. Also, the reporting period for starts is usually one month ahead of the reporting period for the investment series. At present, however, that one-month gap has been extended due to an extraordinary circumstance. One fallout from the partial federal government shutdown has been an absence of Census Bureau workers to process the November put-in-place numbers. With respect to some other key data releases, the Bureau of Labor Statistics (BLS) is still managing to keep tabs on jobs growth, unemployment and inflation. According to December’s Employment Situation report from the BLS, the U.S. construction sector took on an additional 38,000 workers in the final month of 2018. The average monthly climb in ‘hard hat’ jobs in 2018 was +23,000, a gain of +12.0% compared with 2017’s comparable figure of +21,000. The NSA unemployment rate in construction in 2018’s final month was 5.1%, up somewhat from November’s 3.9%, but better than December 2017’s 5.9%. On a percentage-change basis, U.S. construction sector employment in December was +4.0% year over year. The latest annual staffing changes in other pockets of the economy important to construction were: ‘machinery and equipment rental’, +9.2%; ‘oil and gas extraction’, +7.1%; ‘architectural and engineering services’, +3.0%; ‘real estate firms’, +2.5%; ‘building material and supplies dealers’, +0.4%; and ‘cement and concrete product manufacturing’, +0.2%. The slight dip of -1.7% month-to-month (m/m) in total nonresidential starts in December resulted from commercial (-15.2%) and engineering (-23.9%) downturns that weren’t quite matched by an improvement in institutional (+14.9%) and a big jump in industrial (+310.4%). Industrial can display a big swing depending on the timing of a mega project. The December-2018-versus-December-2017 (y/y) rise in total nonresidential starts of +16.9% was based in the industrial (+510.3%), institutional (+38.7%) and heavy engineering/civil (+25.7%) type-of-structure categories. Commercial (-29.5%), however, fell into retreat. The small easing (-2.0%) of full-year total nonresidential starts in 2018 versus full-year 2017 came about because commercial (-11.2%), industrial (-6.8%) and institutional (-2.4%) combined for a degree of decline that engineering (+8.8%) tried valiantly, but failed, to completely offset. ‘Roads/highways’ made up the largest portion of engineering’s 2018 initiations (39%, up from 37% in 2017). Such street starts in December 2018 were -10.8% m/m, but +46.3% y/y and +19.7% ytd. ‘Miscellaneous civil’ was the next biggest slice of engineering in 2018 (19%, up from 17% in 2017) and, in December, it was also down m/m (-72.0%), but up y/y (+24.6%) and ytd (+19.6%). (In December, ytd was full-year 2018 versus full-year 2017.) The next most important player within civil, ‘water/sewer’, suffered a significant share decline in 2018 (to 18% from 21%). Its December starts numbers were +2.8% m/m and +20.2% y/y, but -6.9% ytd. Within commercial starts in full-year 2018 versus full-year 2017, the slices taken by ‘private offices’ (22%, up from 19%) and ‘warehouses’ (16%, up from 14%) widened. In December, the percentage changes for the former were +76.9% m/m and +62.0% y/y, but -3.8% ytd; for the latter, they were -70.9% m/m, -59.2% y/y and -7.3% ytd. Two commercial subcategories with slightly smaller bites in 2018 were ‘hotels/motels’ (20%, down from 21%) and ‘retail/shopping’ (13%, down from 14%). ‘Hotels/motels’ ended 2018 -10.9% ytd; ‘retail/shopping’, -15.8% ytd. ‘School/college’ groundbreakings were even more dominant within institutional starts in 2018 than in 2017 (a 56% share, up from 54%). Educational facility starts in December were +3.5% m/m, +29.3% y/y and +0.9% ytd. The addition of ‘hospital/clinic’, ‘nursing/assisted living’ and ‘miscellaneous medical’ starts to form an overall medical facility subcategory accounted for the next biggest chunk of institutional starts in 2018 (29%, but down from 31% in 2017). Such combined medical facility starts in December were +70.2% m/m and +52.4% y/y, but -8.0% ytd. The Nonresidential Construction Starts Trend Graphs – December 2018 sets out 12-month moving average trend graphs for many of the key type-of-structure subcategories. ‘Retail’ is tapering off badly, as shopkeepers continue to replace bricks-and-mortar locations with web-based selling platforms. ‘Miscellaneous civil’ has also been diving of late, but that’s after skyrocketing higher in 2017 and first-half 2018. Its present lower perch is still well above historical norms. ‘Roads’ and ‘bridges’ are maintaining their upward treks. In December, the four economy-wide compensation increases were all in a range of +3.0% to +3.5%. Including bosses (Table B-3), both average hourly and average weekly pay hikes were +3.2%. Excluding bosses (Table B-8), average hourly earnings were +3.3% and average weekly earnings, +3.0%. For construction workers alone (i.e., as a subset of all workers), the earnings advances in December lay between +3.9% y/y and +4.5% y/y. Including supervisory personnel, average hourly and weekly pay raises for on-site employees were +3.9%. Excluding supervisory personnel, construction paycheck flows were even frothier, at +4.2% hourly and +4.5% weekly. Further on costing, November’s results (y/y) for three key BLS Producer Price Index (PPI) series were: ‘construction materials special index’, +6.7%; ‘inputs to new construction index, excluding capital investment, labor and imports’, +4.9%; and ‘final demand construction’, +5.1%. ConstructConnect’s single-family plus multi-family residential starts in December were -6.7% m/m; -7.3% y/y; and -9.5% ytd. ‘Grand total’ starts were -3.7% m/m; +6.3% y/y; and -5.0% ytd. Click here to download the Construction Industry Snapshot Package – December 2018 PDF. Click here for the Top 10 Project Starts in the U.S. – December 2018. 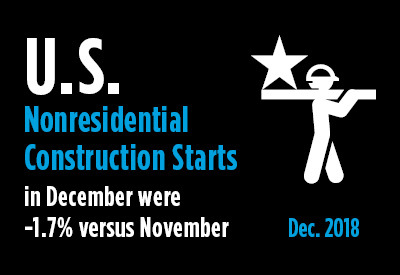 Click here for the Nonresidential Construction Starts Trend Graphs – December 2018.